This 3 star establishment offers Low Rates. Air Conditioned en-suite rooms with DSTV. Free wireless Internet. Free Internet Cafe. Credit Cards accepted. We cater for holiday makers as well as contractors, technicians and corporate clients who need a clean, homely and informal place to overnight at low rates. Most of our visitors feel our accommodation is better than what they expected. For peace of mind - we are star graded and are members of Sapphire Coast Tourism, Amanzimtoti Accommodation Association as well as KZN Tourism. 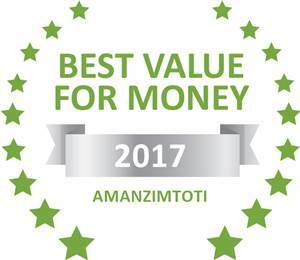 Based on reviews of establishments, Graceland B&B has been voted Best Value for Money in Amanzimtoti for 2017. We have four double bedrooms, 1 double backpackers room as well as a family room consisting of two-bedrooms. The bedrooms all have their own bathrooms, some with a shower and some with a bath. Each en-suite bedroom includes a TV with DSTV, mini fridge, aircon, fan, coffee & tea as well as linen and towels. Two of the rooms have a distant sea view. Rooms are serviced on a daily basis. One of our rooms is a Self Catering unit, while all the other rooms includes a big Breakfast in the daily rate. We also provide light meals ( lunch parcels for work ) and nice home cooked dinners for our guests who wish to eat in (Monday to Thursday). Guests can also enjoy their own Braai (Barbeque) next to the pool, or just sit around the fire in our Boma. Based on reviews of establishments, Graceland B&B has been voted Best Value for Money in Amanzimtoti for 2016. Guests enjoy our Graceland hospitality from the owners as if they are old friends. The dining area with its wooden ceiling has a lot of character and is a popular place for visitors to get to know each other. Many Visitors use our Guest House as a base to visit places of interest in the Durban area. Within 30 minutes you can visit the Kings Park or Moses Mabhida Stadiums. Also, Ushaka Marine World, Durban city tours, township tours, golf course, snorkeling, scuba diving, deep sea fishing, dolphin watching, horse riding on the beach, harbor cruises, cinemas and many more. We do provide low cost transport to any destination as required. We are situated in a quiet cul da sac away from noisy holiday flats and main roads of Amanzimtoti. From the property is a lovely view over the town and the sea which is about 1.5km away (3 minutes by car). 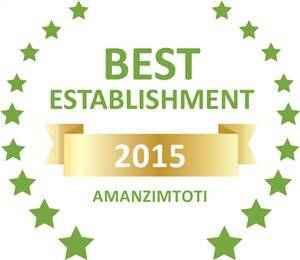 Based on reviews of establishments, Graceland B&B has been voted Best Establishment in Amanzimtoti for 2015. In short, Graceland provide excellent value for money with their affordable accommodation. Holiday makers who do not want to prepare meals and clean up. Junior corporate management and company employees. Backpackers room for those with a lower budget. "This is like a home away from home ...."
"The best value for money we ever had ...."
"The neat and tidy home was a pleasure ...."
"It was so nice not to wash dishes or to prepare food. This was a real holiday ...."